Fleas, they're not the world's favourite critter. In fact they're just as unpopular when they take up residence on your poor cat. If you have a sneaking suspicion that your kitty has fleas here's how to tell for sure. 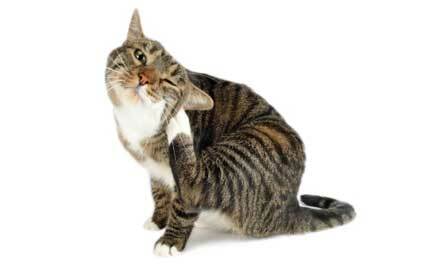 If your kitty is scratching persistently, you should do a spot check. Get out a fine toothed comb and run it through your cat's fur. The best places to check are around the neck and at the base of the tail, that's where she will be scratching or biting. If you see small brown shapes that are about the size of a pinhead in her fur then you may have a case of fleas on your hands. You may also see something that looks like black dust or dirt in her fur, that's what is called 'flea dirt', it's actually dried blood excreted by fleas which is disgusting but a good way to tell if your cat has fleas. You might see some white grains embedded into your cats fur. If that's the case then your cat has flea eggs which means you need to treat the problem ASAP. There are many ways of treating your cat for fleas, orally or in pipettes with topical treatments. It is very important to do so as flea bites on cats can cause anemia.